Backpacking Background: I hiked as a child with my father and started hiking with my now 16 year old son 8 years ago. We now routinely take 20 mile (32 km) weekend hikes (2 nights) approximately once a month year round. Additionally, we take one, 5 - 7 day extended trip each summer. Most of our hiking is done in North Carolina, southern Virginia, Tennessee, Kentucky, and West Virginia. We go regardless of weather so we have experience in all types of conditions. We do not tend to travel very light, my typical pack weight is 25 lb (11.3 kg) exclusive of food. The DryComp Summit Sack is a roll-top dry bag that is designed to convert for use as a summit sack or dayhike backpack. Made of "Hydroseal Coated Antron Nylon" the bag is lightweight, only 11 oz (312 g) on my scale, yet waterproof and versatile. The bag itself is 28" (71 cm) deep. The roll down top is included in that and as it will take at least 4 " (10 cm) to roll 3 times (per the directions, that leaves a 24" (61 cm) "packable depth". The bag is approximately 16" (41 cm) across empty. If my high school math serves me well, this yields a cubic volume of 1536 cubic inches (25.2 L). The manufacturer claims a pack size of 24" X 11" X 9" (61 X 28 X 23 cm) which yields a volume of 1,885 cubic inches (30.9 L). There are 4 compressions straps mounted vertically on the bag, two on the front, two on the back. The ones on the back have shoulder pads on them which are approximately 2" (5 cm) wide by 12" (30 cm) long. The compression sack, with its impermeable fabric, can be used in a pack as a stuff sack for gear that needs to stay dry, or as a food bag. At night, it is designed for use as a bear-bag as the roll top closure will repel a hard rain and is supposed to keep food nice and dry on even the stormiest night. On the front the compressions straps can be unbuckled at the top, leaving you with one male and one female clip. When the user wants to wear this bag as a pack, they simply put on the pack with the shoulder straps and, use the front compression straps around the waist as a hipbelt. While this is not designed to carry any sort of load it is ideal for leaving a campsite for a dayhike with lunch, a water bottle or two and a rainjacket, or for the gear needed for a summit attempt. The pack does feature two web daisy chains on the front, for hanging gear, and a pair of ice axe loops on the bottom. There are also two mesh pockets on the front with elastic closures at the top with simple barrel type fasteners. These could be used for Nalgene bottles or, because they will close up, for smaller items that you want to get to easily (energy bars, lip balm, or even medications such as inhalers for instance). There are no pockets or other adornments inside the bag. The bag is visually attractive with dark orange sides and grey top, bottom, back, and a grey section down the middle bearing the OR logo. All of the straps and webbing are a contrasting grey as well. The summit sack came to me in a simple plastic bag with one hang tag which contains product specs and directions. The information on the tag is found in both english and french. When I removed the bag and checked it out I was struck with how well it is put together. The fabric seems tough, yet supple. The stitching is immaculate. The roll-top closure features a stiff band across the top which holds the bag as it rolls down. This, however, bends in the middle and has a buckle on each end. In this way you simply roll the top down three times, per the instruction, and then clip the two ends of this piece together and it is water tight, and will definitely stay rolled up. I put some ballast in the bag, some fleece items and other random clothing articles. I then, attempted to press the air out, compress the bag, and then roll the top down to seal it. I still got a lot of air in the top so that the bag look and felt puffy. I tried a few times and was able to get it marginally better, but not much. This is something that may get better with use. I will report on this more thoroughly in the course of the test series. The notes are printed on the hang tag that came on the sack. There are Compression Sack instructions which direct you to press the air out of the sack and then roll the top down. As I stated above, I tried this technique and either it needs work, or my execution of same is lacking. In any event I will report further as I test this product. - Two straps become foam-padded shoulder straps; two straps become hip belt." Now, to me, this is not terribly informative. While the shoulder straps are obvious, you can see the pads, the hip belt straps are anything but. It took me several minutes to figure out that they buckled at the top,. Once I figured out that I needed to unbuckle them I did and there was a male and female buckle. I finally saw how it would work. Maybe I'm dense, but I feel like this could certainly have been explained more thoroughly. So far I have carried the Summit Sack on one overnight trip into the Great Smoky Mountains National Park in North Carolina. I filled it with clothing items that I wanted to be sure stayed dry, including sock liners, and thermal underwear in which I intended to sleep. Again, I pressed the air out per instructions but it was still puffy and took up a lot more space in my son's backpack than the items would have taken on their own. That night we put our food in it and hung it on the bear line which the park provides. The next morning we awoke to a fairly heavy steady rain. The food and clothing in the bag was absolutely dry. We left the food in the summit sack when we packed for our hike that day. 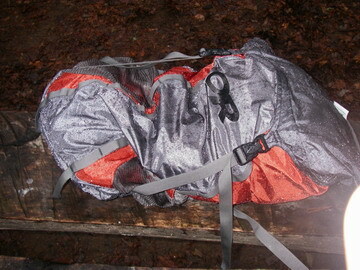 Although we hiked all day in the rain the stuff in the sack stayed nice and dry. I am anxious to try this product as a day pack, and the next trip we will definitely be sure to put that on the agenda. One of our favorite weekends is to hike in to a campsite on Friday night and set up camp. We will then leave that campsite set up on Saturday and take an extended day hike, returning to the same spot to spend the night. On Sunday we will return to our car. It is for this reason that we particularly wanted to test this item. It is advertised with specifically this type of adventure in mind. Water proof stuff sack during the hike in, water proof bear bag overnight, small backpack for our daytime adventure. We will test it in cold wet winter conditions, and in warmer conditions in the spring. I will be interested to see if the lack of any sort of mesh or ventilation fabric on the back will make it uncomfortable to wear in the summer. We will also be paying particular attention to wear and tear issues as we use it for some off-trail scrambling as well. One other question to be answered is if the lack of ventilation on the back causes the bag to become skanky due to my own perspiration which will be made worse by having a nylon bag flat up against my back. These questions will all be addressed in the future. I am looking forward to testing this piece of gear. My initial impression is positive, although I do have some minor quibbles with the directions and a LOT of questions that are yet to be answered. The bag is very lightweight, yet also seems to be very solidly put together and well thought out. We look forward to giving it a thorough test throughout the winter and spring months. This concludes my initial report. Please check back here in early March for my field report. We have used the Summit Sack on approximately 3 different trips in the last 60 days. I took it on an overnight trip to Mount Rogers National Recreation Area in Virginia, on a two night trip to Cumberland Gap National Historic Park in Kentucky, and on an overnight trip to Shining Rock Wilderness Area in western North Carolina. On the trip to Mount Rogers I used it on the hike in as a food bag. I hung it overnight then used it as a backpack on a dayhike the next morning. The bag is a bulletproof, waterproof stuff-sack. I still experienced the same puffiness as I have yet to find a way to get enough air out of the bag. However, it offers a tremendous amount of protection for the items inside. Hanging it as a bear bag was a snap. I could have hung it from the "handle" formed by rolling down the top and snapping it closed. However, this could be hard on the buckle, and there is a nylon loop provided for this purpose so I hung it by the loop. The next morning, after I had finished my breakfast I added a Nalgene water bottle in the pocket on one side, and some chocolate in the pocket on the other. I put my rain parka inside along with my map/compass inside. I hung my camera from one loop on the outside and my gps from another. Equipped in this way I departed on a 4 mile hike with approximately 950' (290 m) of elevation gain. As a day pack I never could really get it adjusted so it felt comfortable. Admittedly, I was not carrying much of anything inside it, but there was no noticable support for anything and the straps seemed to need constant "fiddling" to stay comfortable. One bright spot was the easy access to the side pockets so that I could easily reach my Nalgene or grab a bite-sized Snickers from the other side. I carried it with my clothes inside, using it strictly as a stuff-sack on the trip to Cumberland Gap. In this role it is a mixed bag (no pun intended). On the one hand, I like having the knowledge that it can pour rain and the clothes I intend to sleep in will stay perfectly dry. On the other hand, the bag is heavy, and bulky to use as a simple stuff sack. With food inside, it doesn't trap too much air. However, when containing fleece and other winter clothing that is designed to trap air, it is puffy. I have not yet managed to get it to the point where it doesn't trap a lot of air, and consequently take a lot of extra space in my pack. When I am packing for a winter trip this is a big problem. On our recent trip to Shining Rock I carried it up to the rock, less than a mile from our campsite. As it was quite cold when we went up and began warming immediately as the sun got higher in the sky we began to shed layers. For this application it was terrific. It is large enough to comfortably swallow two layers of fleece from my son and two layers from me. The DryComp Summit Sack is a product that tries to fill a need in the market that I'm not sure exists. In the process it ends up not doing anything particularly well, with one exception. If you need to hang your food outside in a tree in a hurricane, this is your bag. However, it is designed to perform a number of other functions, none of which it does very well. It is not very effective or comfortable to carry as a day pack. The hipbelt, especially, is so thin as to be useless. The shoulder straps are not terribly comfortable and there is no real support for much of anything. The roll top closure is great for keeping out water, but makes it nearly impossible to get enough air out of the bag to keep it from being quite puffy, and wasting a lot of space in my pack. The design could be greatly improved by the addition of some method of releasing air AFTER the top is rolled down. The bag generally adds a lot of bulk to your pack, and some additional weight, while delivering very little in real benefit. Admittedly, I have not had enough opportunities yet to fully test its capabilities as a day pack. That will be the focus of my additional testing. 3) The straps are too narrow to be comfortable. I have continued to use the Dry-Comp Summit Sack throughout the balance of the winter and early spring. I carried it on a trip to the Great Smoky Mountains National Park, using it as a food bag/bear bag. I then carried it into Mount Rogers National Recreation Area where we took it on two long dayhikes in cold, wet conditions. This totaled 5 additional days, 3 additonal nights during the Long-Term phase of this review. On the trip to the Smokies the bag easily swallowed enough food for a weekend with lots of room to spare. With only food inside I was able to squeeze the air out more effectively, so that the bag did not puff up and take a lot of space in my pack. Again, with the top rolled down I intentionally hung the bag by the rolled down loop with the buckle bearing the weight. In the morning, despite a blustery night there was no visible sign at all of any wear and tear on the buckle. 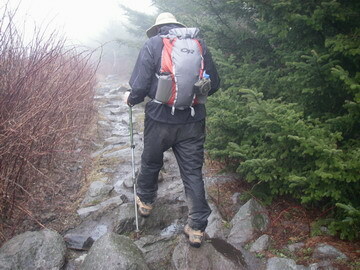 At Mount Rogers I used the bag as a day pack on a cold, wet, rainy day. I loaded it with lunch stuff, some emergency items, and normal things such as map/compass and my trusty camera. Thus loaded we set out on a 7 mile (11.3 km) hike before lunch. The pack rode well on my rain shell and remained comfortable for the 3 hours or so I was wearing it. Everything inside stayed absolutely dry. After lunch we went for an additional hike for about 4 miles (6.4 km) which took about 2 hours. During this afternoon trip the pack became a bit more of a nuisance. The straps would not stay adjusted as the buckles would loosen up and needed constant fiddling to stay properly adjusted. Also, the shoulder straps wanted to move out along the shoulders, causing me to shrug them back up into place. The pack simply did not adjust well enough or stay adjusted well enough to function as a serious daypack. The Outdoor Research Dry-Comp Summit Sack is a superbly made product that functions as a heavier than average stuff sack and a light duty day pack. As a stuff sack it is completely waterproof and functions extremely well as a bear bag, keeping it's contents dry in the roughest weather. It is bulky for use as a pure stuff sack. It tends to trap air inside which makes it puffy inside a pack. This causes it to take up much more space than would be ideal. As a day pack it is certainly light enough, and is large enough to swallow a lot of gear. However, the pack offers very little support and the straps need constant attention to remain properly adjusted. This product is an interesting compromise between two necessary products. As is the case with many dual purpose products, there are compromises throughout. For instance, the straps aren't as wide or well padded as would be ideal for a day pack. They are, however, larger, and heavier than you would typically find as compression straps on a stuff sack. It is an absolutely waterproof stuff sack, but traps too much air and is too heavy. It is a high capacity day pack but offers inadequate support and the straps are not very comfortable. 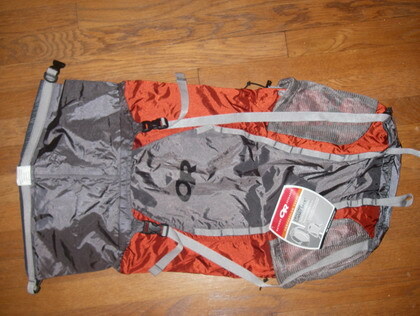 I wish to thank Outdoor Research and Backpackgeartest.org for the opportunity to test this fine product. 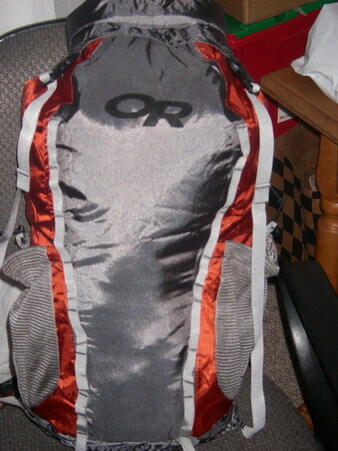 This concludes my review of the Outdoor Research Dry-Comp Summit Sack.